What’s the coolest thing about a hot summer day? Have some delicious frozen dessert! 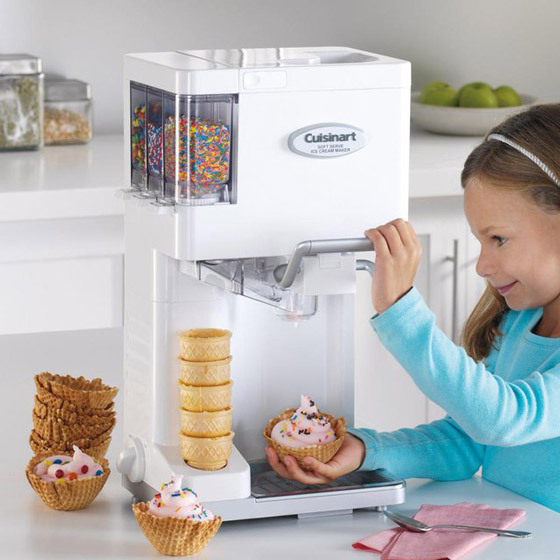 Ice cream, yogurt, sorbet, sherbet smoothies or snow cone, no matter what you want, there is a machine for you to make it. Use your favorite fruit, add sprinkles, mini M&Ms, chocolate chips or other favorites, you are ready to enjoy your delicious treats. And since they are made by youself, you don’t need to worry about things like sugar, additive or food coloring. Healthy and tasty! Make professional-quality soft ice cream, yogurt, sorbet, and sherbet right at home with this fully automatic, soft-serve ice-cream maker. 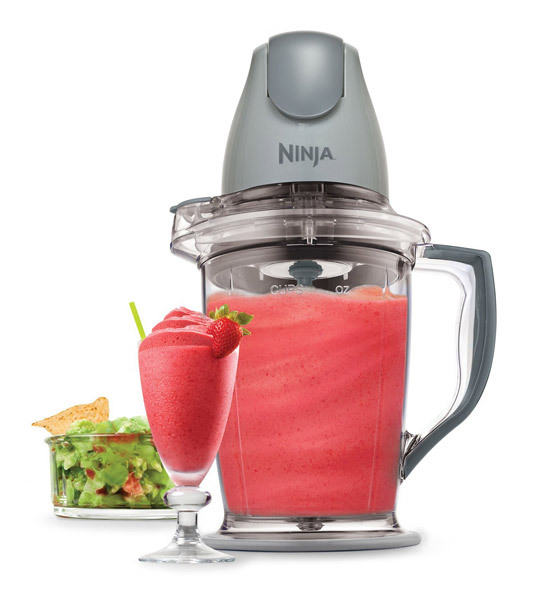 Simply pour in the ingredients and turn the dial–no chemicals, salt, or ice required. The unit’s double-insulated freezer bowl holds cold temperatures and makes it possible to produce up to 1-1/2 quarts of ice cream in just 20 minutes. 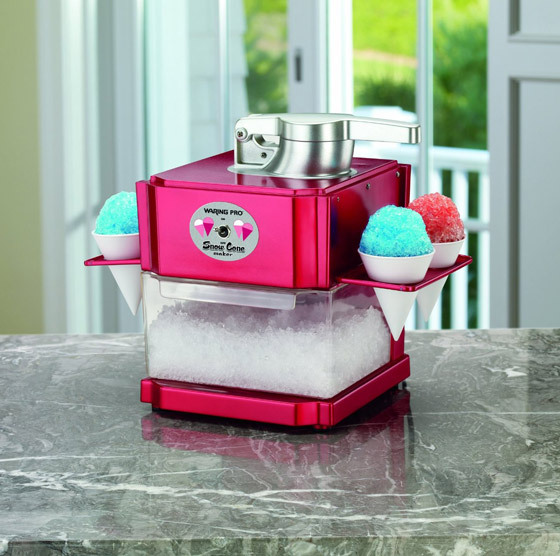 Three built-in condiment dispensers allow for adding sprinkles, mini M&Ms, chocolate chips, and other favorites, mixing them right in to frozen desserts as cones and bowls get filled. 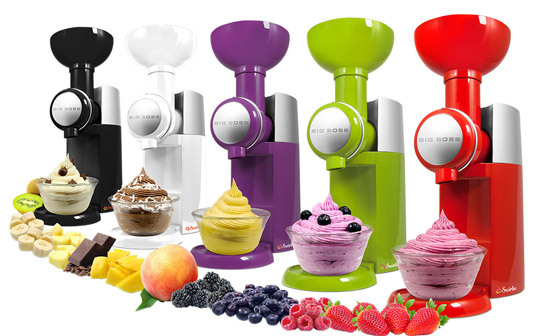 The Big Boss Swirlio makes your favorite fruits into a soft serve frozen dessert in seconds! Peel, cut and freeze the fruits- insert them into the chute and voila, a delicious and healthy dessert is served! Use only with ingredients you consider best for you and your family. Easy to clean and dishwasher safe parts. What’s the coolest thing about a hot summer day? Snow cones, of course. Now you can make your own – plus scrumptious slushes and party drinks – right at home with the Waring Pro Snow Cone Maker. It’s super easy and fast. Just turn it on to shave enough ice for 4 cones in 30 seconds. All you need is ice cubes and your favorite syrups or juices – that way you control the sugar, too. Yonanas turns frozen fruit and other flavorings into a delicious, healthy soft-serve treat. 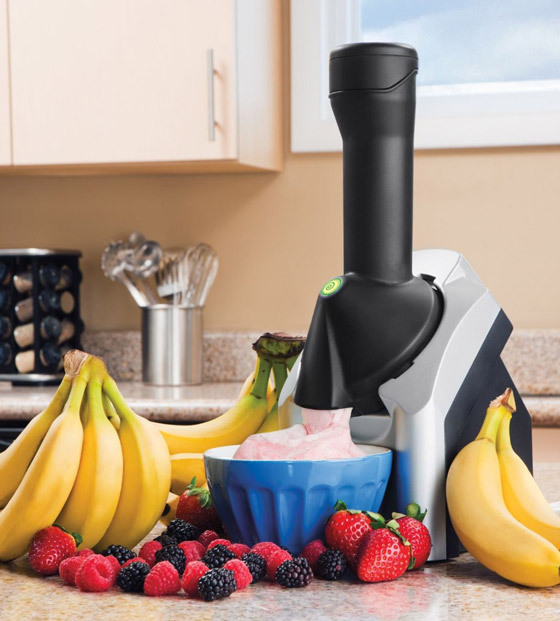 The unit combines frozen bananas and any additional fruit or chocolate and instantly churns the ingredients to produce a treat with the texture of frozen yogurt or soft-serve ice cream, but without the additional fat, sugar, or preservatives. The chute easily accepts berries, sliced mango, or cantaloupe along with frozen banana, and the integrated spinning blade mashes and incorporates the fruit into a silky-smooth confection with the texture of soft-serve ice cream or yogurt.